Approved for road use, the Patrol street sweeper cleans urban areas, such as town centres, cycle paths, large gardens, and parks. It features an enclosed cab, power steering, and a vent that increases suction fan power. This makes for a clean, efficient sweep. Patrol has a cleaning capacity of 23000m2 per hour. 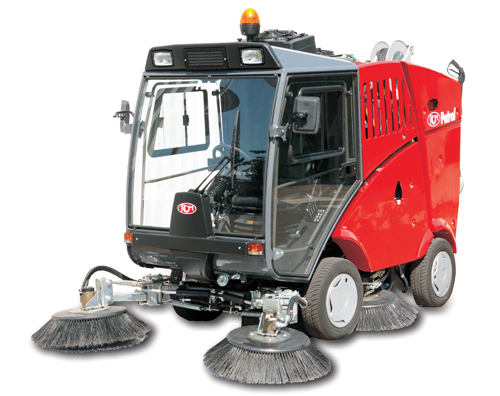 Optional side brushes with full hydraulic control increase cleaning width to 2350mm, and enable the machine to reach inaccessible areas under street furniture and between walls. Operators can empty the 800-litre hopper automatically using the powered, high-dump function.